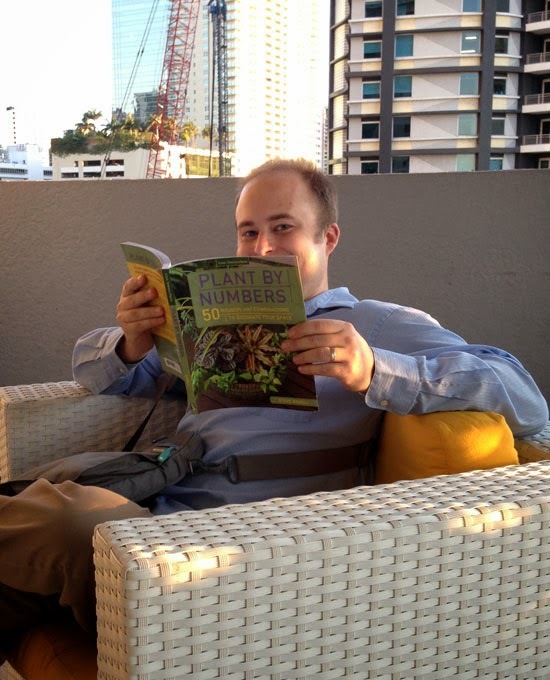 The Rainforest Garden: Plant by Numbers Release Day Giveaway! 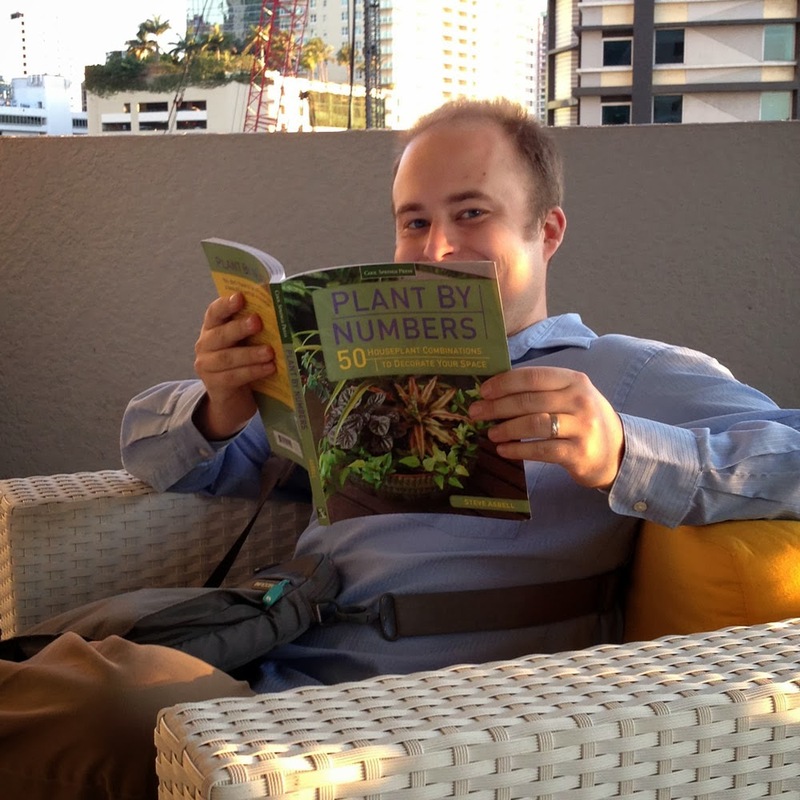 Plant by Numbers Release Day Giveaway! My book finally came out today and I'm so excited to finally share my approach to indoor container gardening with the world. 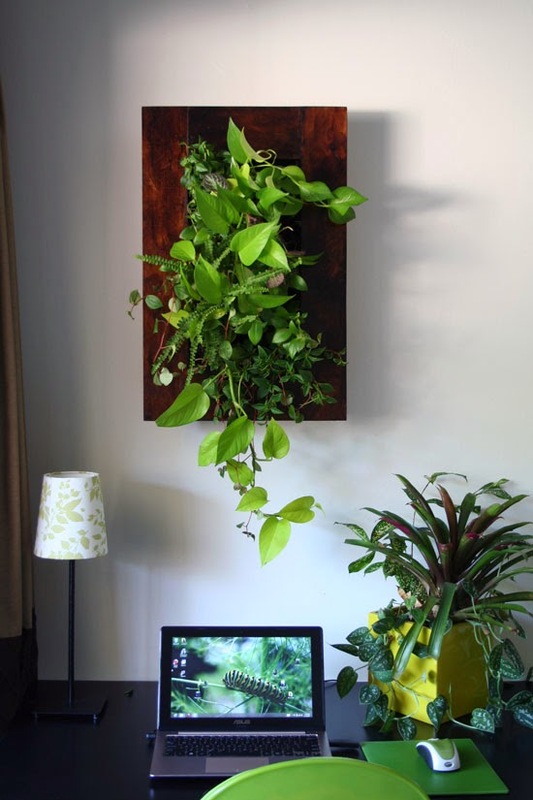 To celebrate the release of my book Plant by Numbers: 50 Houseplant Combinations to Decorate Your Space, I've teamed up with some superb houseplant suppliers to give away $100 worth of prizes that will help you make your own living arrangements! 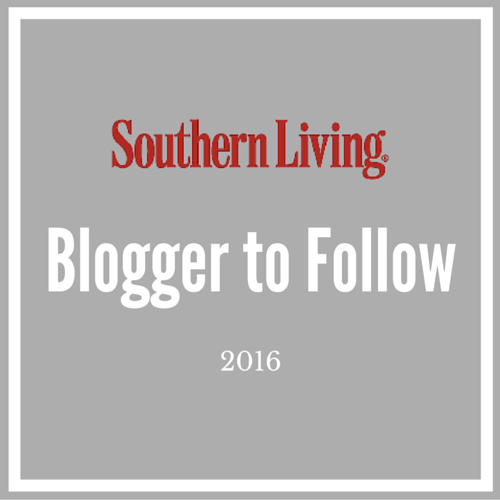 Read on to learn more about my book - and how to win. 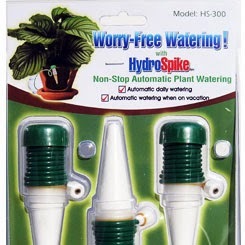 - These houseplant irrigators are so cool! They water your houseplants while you're on vacation... or when you're feeling particularly lazy. I won't judge. - That's right! 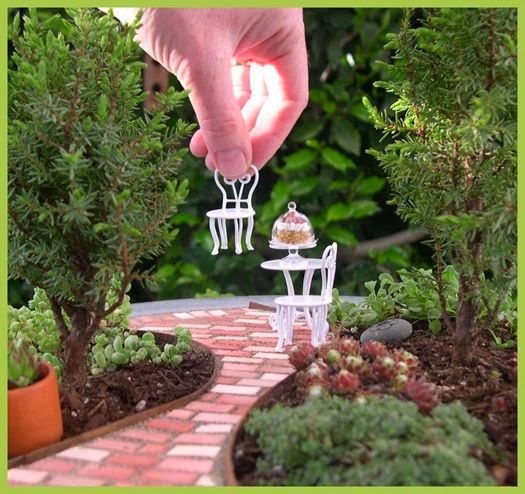 Two Green Thumbs is giving away twenty five bucks to blow on miniature garden supplies and plants on their online store. 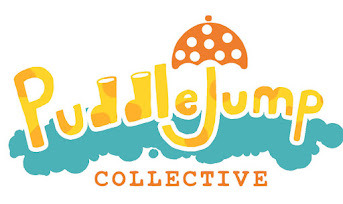 Their stuff is awesome. Haworthias are used heavily in my book because they are among the most shade-tolerant of succulents and work well as houseplants. These three make a great combo! It's a great book, the author is one heck of a guy, and you should totally buy one in case you don't win. If you do win and already have a copy, I'll just surprise you with something else instead... because I'm one heck of a guy! If any of these prizes appeal to you, then you're going to love Plant by Numbers. As its subtitle implies, the book really does have 50 unique container combinations that I designed using houseplants - but it's so much more than that. 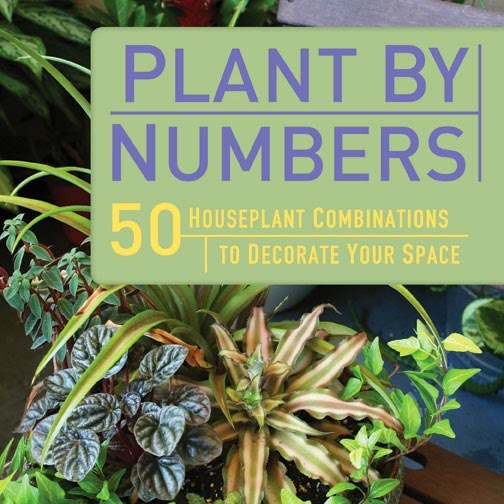 Apart from being a floral cookbook, Plant by Numbers is your guide to combining houseplants and designing your own artistic living arrangements. It has everything from miniature gardens to grand and statuesque indoor jungles; tabletop herbs to innovative vertical arrangements. I want this book to inspire you to create a garden wherever you are; even if a windowsill or desktop is the only plot of land you claim as your own. 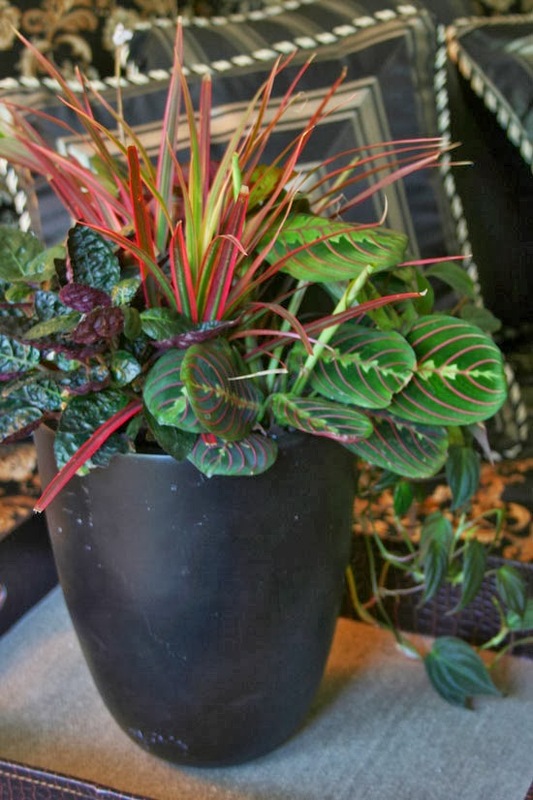 Contrary to popular belief, you really can combine houseplants just as you would combine them in the garden! I show you how to select compatible plants, arrange them to the best effect and give them the care they need for a long and healthy life. Because the goal is to show you how to make your own arrangements, I've even included lists of houseplants and grouped them by water needs, light requirements, colors, forms, functions - you name it. If you have a hard time finding the plants used in the recipes, then you can find them on the mail order websites listed in the appendix - or select one of the alternate choices listed. Intrigued? Then kindly head to your nearest bookstore or follow this link to purchase a copy online. I really think you'll like this book, but I am admittedly a little biased. You may enter once a day by leaving a comment about the type of indoor container combination that you would love to design for your own home! I want to hear about what kind of space you're working with, how much light it gets, what plants you'd use... the more details, the better! I will randomly choose a winner when the contest closes at noon EST on March 8th. Entrants must be legal residents of the continental United States and are responsible for leaving their contact info. 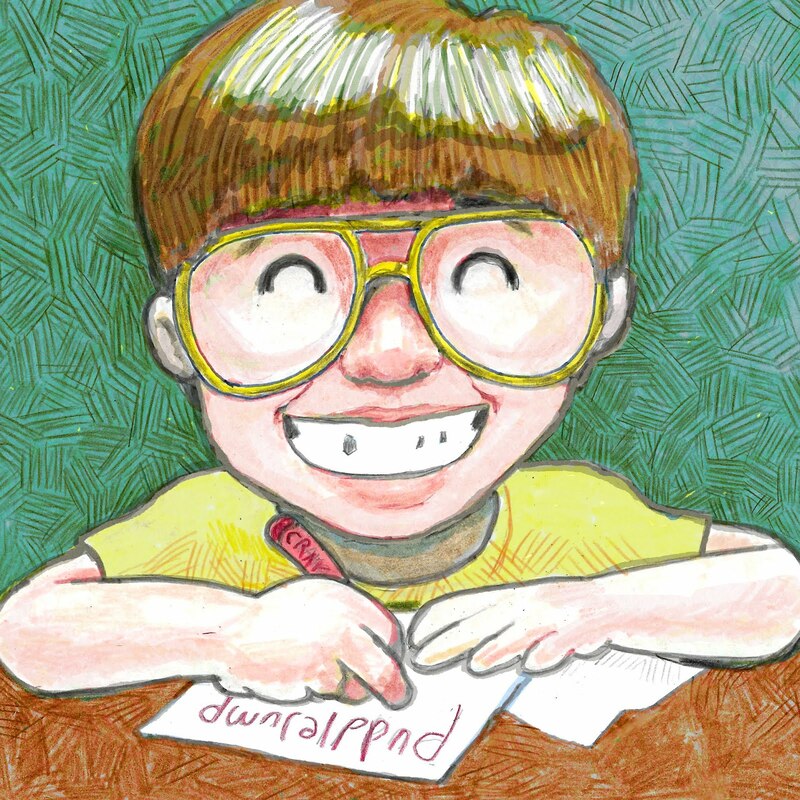 If I cannot contact a winner by noon, March 9th, I will draw another name. Prizes are furnished by Hydro-Spike, Two Green Thumbs, Southeast Succulents and Cool Springs Press. Good luck! 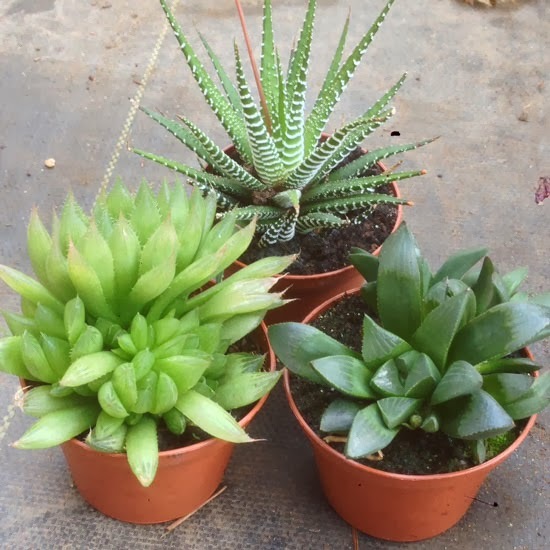 I absolutely love the 3 succulent plants that you have in the giveaway and know the type of dish in which I would like to plant them. It is a wide base pottery piece that I picked up at a flea market. Since you say that do well in low light, I have a coffee table in my family that is in dire need of some plant life. To the display, I would add a few colorful river rocks and a small ceramic frog that really needs a home. Haworthias are some of my favorite houseplants. By 'low light' do you mean that it's downright dim? How close would it be to a window? 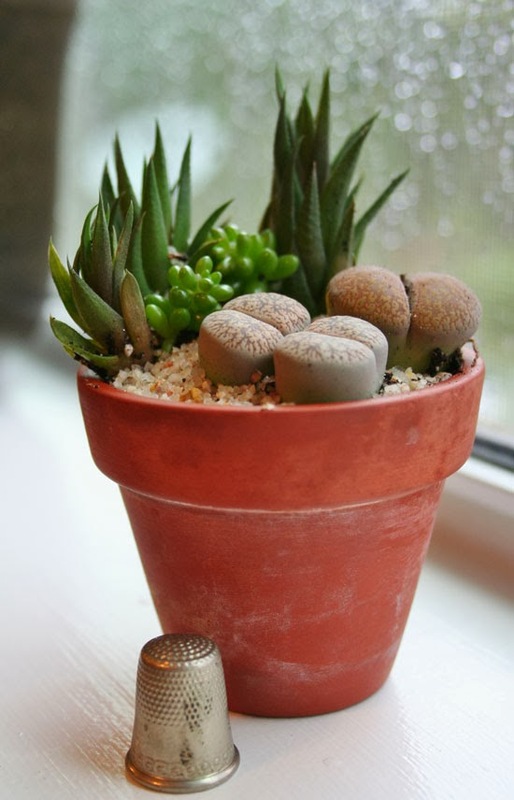 Anyways, I love your idea and think that river rocks will look superb with the Haworthia. When I say low light I mean that the room in on the south side of the house. Perhaps I should have said indirect light. The room is bright but not sunny. One edible that I know you could grow even away from a bright window would be mint. If you have a windowsill with nice rays of light you can grow rosemary, thyme, and even citrus! ��I would use streptocarpus as a center high point, surround it with miniature african violets and interplant alpine strawberries with the runners cascading over the edges of an upside down straw hat container. This would be best with a spotlight hort. bulb shining onto a lone side table in an entryway for sight upon each entry to the home. That's a great idea! I was tempted to combine streptocarpus and african violets but somehow didn't. Do strawberries like the same conditions? That sounds like a really creative combo. I would absolutely, positively love some orchid plants that I could actually make live....I do not have windows in my bathrooms but have plenty of windows all through my house and I know by reading all your "goodies" that you could help me..It would also be nice to learn more about growing herbs and medicinal plants..I do plan to purchase your book really soon unless of course, I win one...I live at the Crystal Coast of North Carolina and I do believe we've had the coldest in years...Hurry Spring ...I desperately need to get outside and "play" in the dirt..I have RA and some days I can't move too well..but I surely love to try...Congrats on your new addition coming in April..My son was born on April 17th and will be 43 years old this year.......May God continue to bless and so looking forward to your book and send my best wishes for your future. We have beautiful eastern sunlight pouring into living room through our picture window from sun up until early afternoon. This space has been my favorite place to showcase plants and currently the star is my Crassula arborescens 'Undulatifolia' (jade) which lives in a beautiful blue ceramic planter residing there. The jade is getting taller and branching nicely but is needing something at her feet. 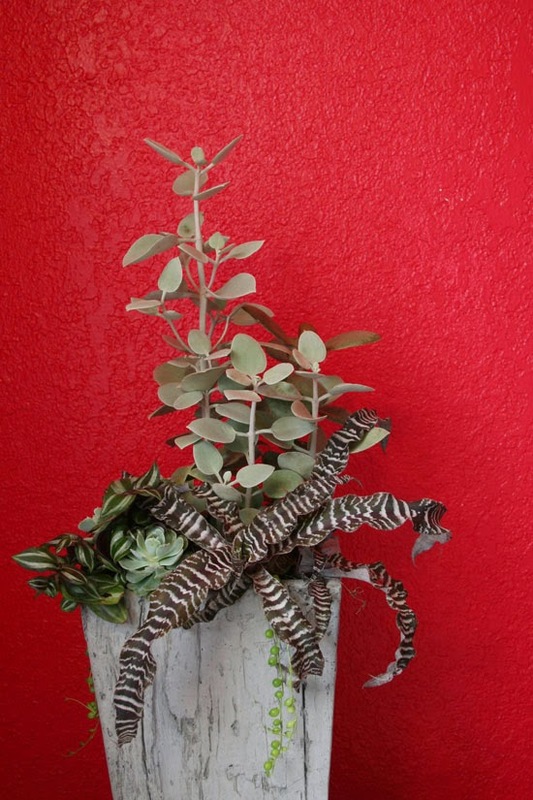 I get bored with single specimens quickly and enjoy the artistry of plant combinations with different textures and colors playing against one another, especially in containers. I'm searching for plants to add beneath my jade that will take us through next winter and beyond without too much work. Last summer I had planted what grew to be a rather a gangly sedum along the edge of the pot. But it seems to me it really needs a couple of different textures playing underneath those wavy leaves to help finish the picture or a larger container and some real drama! This perfect spot in our living room is, as it turns out also the perfect spot for wintering tender succulents and other houseplants that enjoy good light. Late spring we move the plants outside onto the front porch for their summer vacation. The cool thing is that there is little change in light exposure which lessens their stress and my worrying over them. I would keep them indoors all year but unfortunately we have to cover that window in the warm/hot weather or risk a baking hot house. Sadly, I notoriously bad at watering houseplants which make succulents perfect for me. It's only taken two decades for me to figure this out after watching many other tender garden plants suffer over the with my neglect. I was so excited when the lights on...chalk it up to learning the hard way. Another issue we have in our home is dust, and lots of it. Whenever the weather is mild enough our window and doors are wide open and when it's dry, like all summer is here, the dust boils up from the busy street in front of our home. The beauty of succulents is that most don't show the dust like those shiny green leaves of other plants and they seem quite at home in it. There are other options for the jade I suppose, like create a tiny miniature garden beneath it's shade. I just might do that, if I can find the right plants for that type of garden. Congratulations Steve! I'm so happy for you! I have pretty limited light in my house during the summer, slightly more in the winter, so I don't have a lot of plants inside. 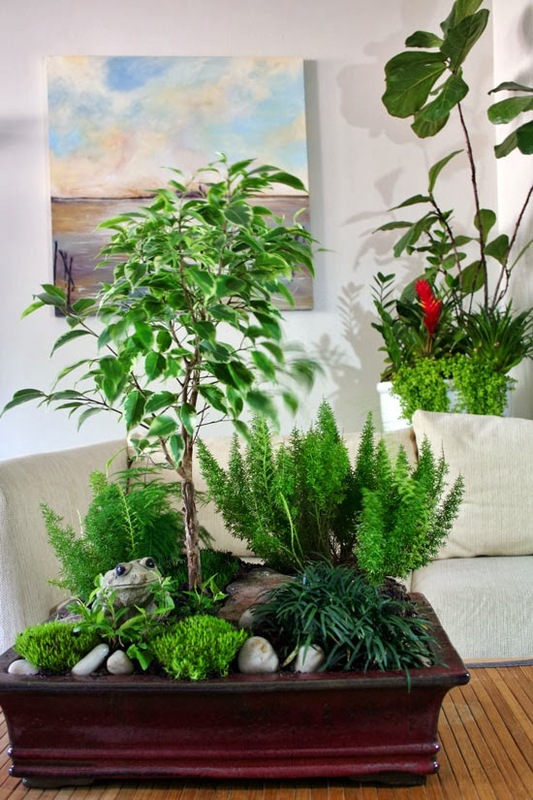 I have always want to do a bonsai tree arrangement, but never got up the nerve. I love the one in your photo and it has inspired me! I will be attending the Philadelphia Flower Show this week and I know they will have several specimens to fill me with ideas. I already have the perfect garden dish and with the Two Green Thumbs Miniature Garden Center gift certificate you are giving, I know I will achieve a beautiful arrangement. I would love to try my luck at using a juniper bush because I think they most resemble a pine in the wild. I am not sure what type of light it would need, but I have a heated solarium with plenty of light if needed. In the summer, I could put in on my back deck for an added feature. And most of all ... I think it would be fun! Well, that's it! I just returned from the Philadelphia Flower Show and I am so in love with the bonsai displays! Some of them were over 100 years old and I am so determined to make one for myself! I can't wait for my copy to arrive - just waiting on Amazon! I recently relocated from the South (TX/FL) to NoCal, and I am rediscovering gardening through a whole new climate (same zones, though). Still apartment gardening, still addicted to tropicals and succulents, now navigating lower humidity, much less rainfall ... My biggest challenge is matching water/soil needs in group plantings! I love the vertical wall hanging types! Love this idea for a book, exactly what I need. I love the look of combined plants, but am intimidated by them. We have a room that gets Eastern and one that gets Western light. Would love to do something inside so I can continue by miniature garden inside to enjoy year round. Hey sweetie! How fun! Before I order a book and review I want to try to win one first (cheap person that I am lol). But I would like to add more indoor plants since I am filling up the outside. My home has lots of windows with most being on the North and West sides. We get really hot temps here in the valley in the summer so I would have to be careful with placement near the West windows. 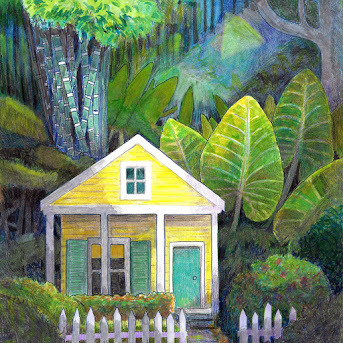 My home is decorated Tex/Mex style and painted 5 different colors. So I just love Talavera and of course succulents! Edibles plus ornamentals together. Fascinated by vertical plants as well. You were the winner of the hydrospike hd-300 but I need your email! Please send it and your mailing address to steve_asbell @ yahoo.com when you get a chance. I would like to do a container arrangement for my master bath. The lightening is bright and indirect so I am thinking about an ivy topiary! I already have an English ivy with a really good start and I have a wire bunny form that I could use to twine it on. The moisture in the bathroom would be great for the ivy and the bunny shape would be an interesting focal point. Carol, you won the hydrospike HS-300! When you get a chance, just send your mailing address to Hydrospike (tina @ hydrospike.com). Thanks for entering and leaving lots of cool ideas! Thanks so very much! My plants will appreciate it when I'm on vacation! I have a east facing window in my kitchen, the only time it gets sunlight is on a midsummer morning. So I have been mulling over other combinations I would like to do and was thinking I've always wanted a stag horn fern hanging on a wall somewhere. To have one with other plants would be even more amazing. Haven't a clue what would go with one though. Just love the drama of the staghorn. I have a sunny window with a shelf devoted to for plants in terrarium. These are the decorative terrariums that are all the rage now. I focus on small growing tropical plants rather then succulents (succulents are cool too). Planning on setting up a planted terrarium in a 20 gallon tank w/ lighting for fusser plants and maybe house a dart frog. I just purchased a glass terrarium and am planning to plant it with mini succulents. I'll surround them with some sort of moss and place pebbles randomly hoping to mimic a forest scene. I would like to place it on a side table in my dining room where it will receive plenty of indirect bright sunlight. I'd love to do a Bonsia combination love the one your showing. My passion is roses! I have about 35 outdoor bushes, but have always wanted to have a few miniature ones as houseplants. I have tried in the past, but could never get them to survive past November or December. They always seem to get spider mites. 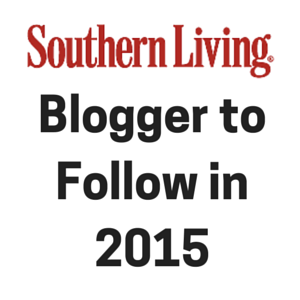 This year I am going to try again! Several years ago I started a pack of cactus seeds not knowing what would happen. Much to my surprise I have about 15 thriving cacti in various varieties! This summer I would like to take them outside and make an arrangement in a sunny section of my garden. I won't take them out of the pots, but rather cover the pots with sand or mulch so they look natural. Come fall, I'll bring them inside until the following summer! Can't wait to hear who won!